Last month my blog turned five! I can't believe how quickly that time has gone but I also feel like I have come such a long way. I genuinely love being part of this community, I have learnt so much, made true friends and feel lucky to have found my tribe. Sewing can be an isolating pastime and connecting through my blog / social media has really given me so much inspiration, encouragement and support. 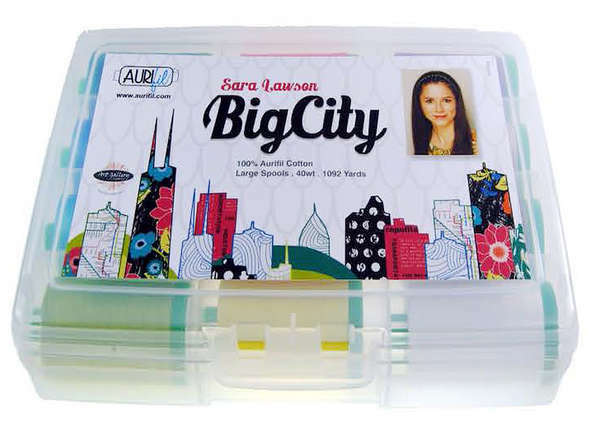 As a thank you to all my lovely followers, I have a big box of delicious thread from Aurifil to giveaway! The box contains 12 beautiful spools of 40wt Aurifil thread. This thread is perfect for machine quilting, embroidery or appliqué and can also be used for hand piecing. 2425 (pink), 2530 (bright pink), 2225 (peachy orange), 2115 (yellow), 1231 (green), 4093 (deep turquoise), 5005 (blue), 1320 (true blue), 2510 (lilac), 1243 (purple), 2021 (white), 2625 (gray). 1. Leave a comment, since it is Harvest Festival here in the UK tell me something you are thankful for today! ⟡ Open internationally, a winner will be chosen on Tuesday 4th October 2016. Thankful for healthy family and friends (and re:sewing, thankful for a supportive IG community!) Congrats on your 5 years and thanks for the chance to win some beautiful thread! Since Illinois is hot and humid in summer, I'm totally thankful fall weather is here in temp as well as the calendar! 63° and LOVING it! Today I am thankful for Universal Health Care (I'm from Canada). I am currently in Atlanta, Georgia, and had to go to emergency. Thanks to my travel insurance (which I don't pay extra for) I received great care and everything is paid for. I feel so badly for people in countries where they have to pay astronomical amounts of money to receive the care they need. Congrats on your 5th anniversary! I am thankful for my cancer care team who are taking good care with my second kind of cancer and that they caught it early! I am thankful for my sons, daughter in law and three grandsons who keep us laughing! I am so glad for fall temperatures finally here in Tennessee! There are so many things to be thankful for! I know exactly how you feel about sewing being an isolating activity. I have no personal friends who sew, so connecting on line with people is the only way I stay in the loop. This season, I am thankful for my wonderful husband who retires tomorrow! He's been with John Deere for 38 years and we are ready to start the next adventure in life. Travel, lazy mornings/days, long walks, and everything life has to offer! Congratulations on 5 years in blogging, Lucy, and thanks for celebrating with one lucky reader! I am thankful for the cooler weather that has moved in this week. So nice to actually feel like fall is on the way! Thankful for my family! Thankful for the time yesterday with my daughters family making applesauce and pie. Thankful for the recent vacation was on with my sons family. And there is so much more. Congrats on achieving 5 years in your blog!!' Shared on Instagram. Today was the first day I could wear sleeves and not sweat. I ate a lovely fall apple and basked in the sunshine without dying of heat. It was glorious, a small thing that made my day. Hello, I'm thankful for my family,and the times when we all hang out together! Happy bloggy birthday! I'm thankful for our sewing community - I feel blessed to be part of it! Ooh, love the box of gorgeous threads! I am so thankful to have four loving children who support my odd quilting habit as 'normal'. :) Happy Blogiversary! Sewing wise, I love-love my new sewing machine so much! Just hemmed my son's lined pants and it went through all layers without thread breaking, jams, pulling fabric through etc. I am thankful for my family, friends and my furry members of my family. Congratulations on your 5 years. I shared your post on Instagram. I'm thankful that it's nearly the end of the week, it's been a long fortnight! I'm thankful for my family and also the cooler weather here in the desert!! Also thankful you are sharing this thread!!! Congrats and happy anniversary to you and your blog!!! I am thankful every single day for the inspiration and support shared among makers. Oh I love Aurifil! And you too! Congrats on five years!! I am thankful for my friends, whether online or in real life. And I would certainly be thankful for a box of Aurifil goodness. Thanks for a chance to win. Congratulations... So many of us have enjoyed your sharing over the past 5 years. You will never know how many lives you have touched. Keep blogging! Congratulations- and hope for many more! Congratulations on celebrating 5 years!! I am thankful for the support of my family and friends. LOVE YOUR BLOG+YOUR INSPIRATION SO MUCH! CONGRATS ON "5" ! THANKFUL ALWAYS FOR THE LORD OUR SAVIOR! THANKFUL FOR ALL OUR FAMILY+FRIENDS! I am thankful for a loving and supportive family. Happy blogiversary Lucy! I am thankful for my family - my girls are on holidays with their grandparents at the moment and I miss them terribly!! Here, in Melbourne (Australia), I'm thankful that winter is drawing to a close, and daylight saving starts this weekend - beginning of summer! Love your blog, and congratulations on your anniversary. I shared your giveaway on Facebook group for Domestic Machine Ruler Quilting. Love your blog happy anniversary from Wards River nsw Aust. Congratulations on five years of sharing your journey! I am grateful that my youngest isn't yet enough of a moody teenager to stop sharing his joys and woes with me! That time when he comes home full of stories is extra precious when you can see that it won't be long before he'll stop sharing and becomes a proper grumpy teenager! Congratulations on your 5 years Lucy. I am thankful that I am able to get up everyday and do the things I love. Thank you for the awesome giveaway. Happy Blogversary. I am thankful for the good health of my family. Happy 5 years! I'm thankful for my healthy toddler! Congratulations Lucy. Glad that winter is nearly over and thankful that summer is on the way. I'm thankful for all my blessings...family, health,and all the creativity around! Thanks for the awesome giveaway! I shared on instagram! Thank you. I love those colors and they would be fab on my spring line of dog collars! I am thankful every morning for the fact that I can get up out of bed and move through the day under my own power! Thank you for the chance to win this beautiful thread box! Happy Anniversary! Love the thread colors would make some beautiful hand work. Thanks for the giveaway! I glad the weather has finally cooled off and we're able to save some electric by not having to use the a.c.! Congrats on your 5 year anniversary for your blog! I'm thankful for my friends and family who cheer on my sewing creativity and give me love every day. Congratulations! I'm absolutely thankful for love, health and inspiration. Congratulations!! I'm very Blessed and Thankful that I'm able to have my grandson over this weekend. He hasn't been here in several months so I'm super excited! I'm thankful for my home and all who share it with me. My husband, children, cats. It's our happy place. I'm really thankful I have the next 4 days off work and hubby and I are off on a little adventure! I'm thankful for my husband who is so supportive of me (and my quilty habit) and my fur babies 🐶🐶. I am thankful to be home after traveling for business and hope for some sewing time! I share the giveaway on Fb. I am always Thankful for my friends and my husband who drives me crazy at times. Today I am thankful for the late summer sunshine and a few peaceful minutes to enjoy the nature in my garden. Happy Blogiversary, Lucy! I found your blog earlier this year, and added it to my feed. It's a joy when "Charm About You" appears in the titles of the day. Keep up the lovely inspiration! Here's to another 5 years! Congrats on 5 years! I am thankful for a health family, crisp fall morning air, and my sewing that help keeps me sane! Email is melsdaisypatch at gmail dot com. Congratulations! I'm grateful for getting to a place in my life where I'm leading the charge rather than settling for what I can get. And also for all the plums and apples falling off the trees ;). Congrats that is wonderful! I'm thanks for the cooler temperatures, that my family gets to be home together right now, and that everyone's health is good at the moment. I'm thankful for my husband. I never knew such love and support existed. Thanks for the lovely giveaway, I am thankful for my new Juki sewing machine I've been looking for almost a year and I couldn't be more pleased with my final choice. Congrats on 5 years! Your work really inspires me! And I love you are doing it all in my beloved Manchester!! Congratulations on your 5th anniversary. Today I am grateful for my house, my 2 sons, fresh air, the beginning of a sewing weekend!!! Thank you for this nice giveaway! I never have too much thread! i am most thankful that in our 70s my husband and i have been blessed with very good physcial and mental health. i shared on pintrest. thanks for the chance to win. Happy Blogaversary! I sm of course thankful and blessed with a loving family. But I am also thankful for my chickens who are now laying the most delicious eggs. They also being me joy with their individual personalities, they can be so funny at times. What a lovely giveaway. I am thankful for the online sewing community, and the willingness of others to share their knowledge and skills, such an inspiration! Congratulations on reaching 5 years blogging. I am thankful for feeling pretty good these days due to physical therapy. It's interesting being complacent about good health until you don't have it anymore. I'm also grateful that my son and his family live close by so that we can see each other often...in fact, they will be over for dinner tonight. What a lovely selection of thread colors. Thanks for the chance to win. Cooler weather here in AZ. Posting on IG. Thanks. I am totally thankful for the wonderful life I have had so far. I have been so lucky, good health, a warm and comfortable home and of course a beautiful family. I'm thankful for my family (husband & 2 dogs) as they support me though difficult times & my poor health & disabilities & they tolerate all my craft stuff around the house. Dispite terrible circumstances with my health there aways there for me & give me the strength to fight on. Congrats on 5 years! I am thankful for family, friends, beautiful fall sunsets, and time to make quilts. I am thankful for all the wonderful quilters out there who graciously share their quilting wisdom. Oops Katie S. forgot to add email--kms1 at outlook dot com. Congratulations on 5 years of blogging!!! I'm extremely thankful that our first grandchild is doing well after being born 3 months early, weighing only 1 pound, 10 ounces...he's now over 4 pounds :o) Thanks for the sweet giveaway! 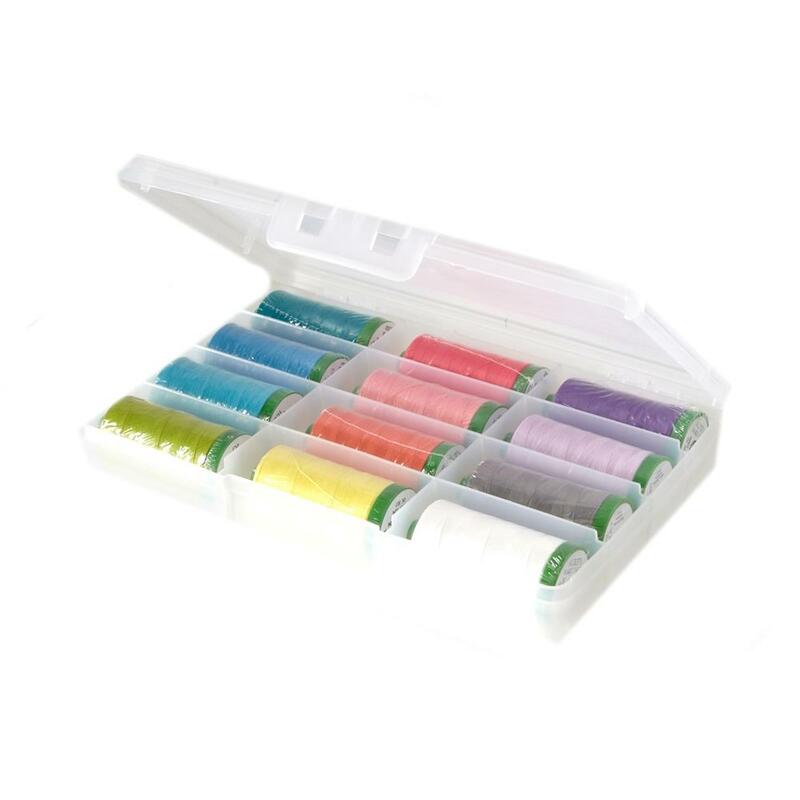 I love Aurofil thread and this box of delicious colours looks good enough to eat. What am I thankful for? Life, family and good friends. Lucy, I'm thankful for quilters like you who share your lives in blogs...your successes, failures, hopes and dreams. Thank you from the bottom of my heart. You give me the courage to try new things. I am thankful that at 70 I am fit, healthy and still very happily married after 48 years to a man who encourages my craft attempts! Five years is commendable. It can be hard finding the time to keep your blog interesting and fun when you have a busy life! Congratulations. I will share this on my quilting Marietta Account. I have a Facebook group and they will all see it! I am so grateful for my Grandchildren, they light up my life! I'm eternally grateful to my family. I live for my Moo, and my family help me raise my moo. I couldnt do it without them! Congratulations on the 5 year blogversary .I am thankful that next January we will have a new member in our family,I will be a aunt again and the godmother,I`m very happy with the news. Congratulations on your 5 yr anniversary. I think I have been following at least 2 years. I am thankful for being healthy enough to enjoy retirement and this wonderful time of life! Congratulations! I'm thankful for my husband and family. Thank you for the great giveaway. I'm thankful for such an amazing creative crafty online connection... i dont have any friends that sew, crochet or "craft". It's an incredible age we live in where someone's beautiful ideas can be shared with people all over the world and offer inspiration at any time of the day! Congratulations on 5 years of inspiration! Keep up the good work lovely! I am thankful for my dear six-year-old granddaughter. Tomorrow we are going to an apple festival and she is excited about getting a caramel apple on a stick and seeing a puppet show. She reminds me to find joy in every day. Congratulations on 5 years! And thanks for all that you share! I'm thankful for cooler temps now after a hot summer! Today is my son's 17th birthday. Thankful to see him grow into the young man he has become. I shared on Instagram as ceciliaquilts. I'm thankful for so much! Leaves changing, cooler weather, new friends, the vacation I had (returned today) good food, sewing time and the support of my brother and his wife (my BFF) while we help Mom after Dad's death, and her dementia issues. Congrats on your goal, and thanks. Well done on the blogiversary. I am thankful that my eldest son seems to have settled well at university. Congratulations! At the moment I am just so thankful for the place I am able to live. It is just so beautiful and the weather was absolutely fantastic! Enjoying the cool weather Leaves changing color and family Happy Anniversary !!! Congratulations! What a generous way to celebrate! Today I am thankful to have a low key Saturday with the family. Congratulations! Today I'm thankful for this stitchy community where I can get fab patterns and tutorials and ask for help when I'm getting stuck! Congratulations! Five years is quite an accomplishment! I am thankful that I am able to retire next year. I can't wait! Thanks! Please click in the delaineelliott above for my email link. Happy anniversary and thanks for all the inspiration you provide. I'm thankful for family and quilting friends. happy blogversary! :) 5 years is quite a good run. congratulations! while i am always thankful for my husband, and family, and friends...i am also thankful for much more. one thing i am thankful for is blogs like yours...the inspiration, helpful hints, and tutorials are such a delight day in and day out. another thing is that i am thankful to be able to create everyday and the unwavering support my husband gives me in my endeavors. thank you for the chance to win this box of awesome thread! Congratulations! Today is my birthday, and I'm thankful for my hubby, family and friends giving me so much fun time and love today! Congratulations! I'm thankful for the ability to sew and enjoy my family, garden & friends! Thankful that the art of stitching is still alive, and being share by so many and taught to so many. It really makes our world bright and beutiful. THank you Lucy for always sharing your talents w/us readers...I'm so thankful to have discovered your blog. I'm thankful for my healthy family and my sweet grandsons! Congrats on 5 years! I'm so very thankful for my grandson who will be 2 months on wednesday! I am thankful that even though I've broken several bones in my left hand that I can still sew! More thankful for my wonderful husband who has taken on the chores I can't do. Thank you for the opportunity to win. Congratulations, Lucy! Amazing. And here's to another 5! I'm always thankful for my kids. They keep me running, and they are so worth it! Congratulations Lucy, I'm thankful to have internet because I live in a very isolated village. Today I am thankful for my husband who has been away on business for two weeks but is finally home! I am grateful for my quilting hobby. It provide me with so much joy. An I am also very thankful for my parents. I sometimes take them for granted, but when I needed them the most they were there and I am grateful for that. I am thankful for my elder brother.